FindDoc (https://www.finddoc.com) is a fast-growing startup that provides the most comprehensive healthcare information to the general public in Hong Kong. 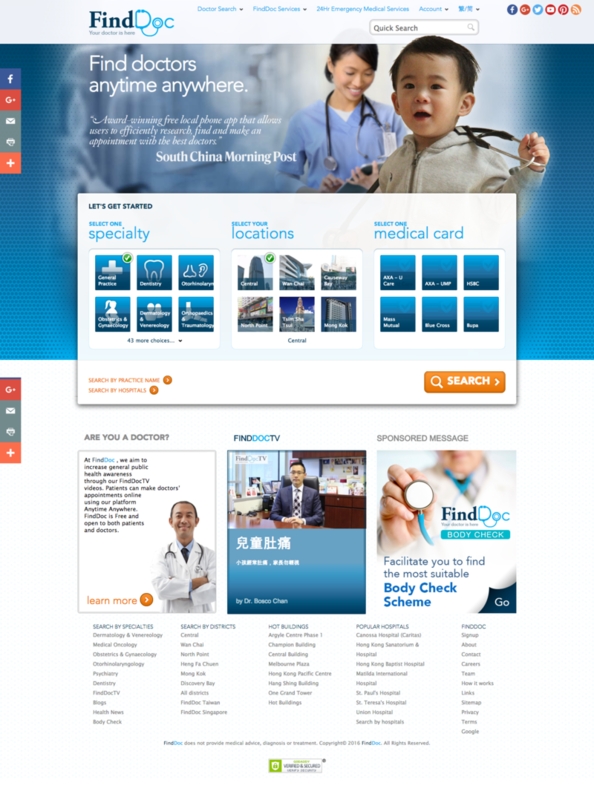 The FindDoc platform not only provides 7,000 updated and accurate medical professional information, but also the largest health education video library in Hong Kong and China. The videos cover a range of 24 specialties, offered in Cantonese, English and Mandarin. FindDoc recently launched a brand new web application which is designed with the general public in mind, to help users find the most suitable medical professional in a reliable and user-friendly manner. With a location-based search capability, using their smartphones, patients will no longer have to worry about not finding a doctor in their vicinity, no matter where in Hong Kong they are situated.